Claire in Tuba Town: A Canadian "Clown"
This is Joe, the "clown" to whom I owe my many thanks for the free tickets to the show. 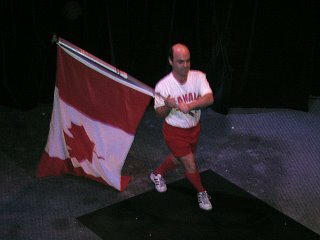 Joe performed two acts, one as an olmympic gymnast or interpretive dancer for Canada, and the other as, well, maybe a lounge singer. Are Canadians considered to be instrinsically funny in France? Because I can see no other reason for this guy drawing a crowd of people wanting a good laugh. I know the French mock the Quebecois accent and everything but this guy looks more English-Canada. Hmm. Unfortunately you couldn't see him action. I think what was funny was a combination of things. For one, he was really quite short. I'm not going to classify him into any small-people category, but he was little. Secondly, he did an amazing dance routine. Thirdly, he's Canadian. But he doesn't even try to sell the Quebecois thing. He speaks French fluently and lives in France, but he did most of the show that I saw in English. I dunno. . . I think you would have liked it.